On hand as a presenter, Thandie Newton attended the 50th NAACP Image Awards at the Dolby Theatre yesterday evening(March 30th) in Hollywood, California. 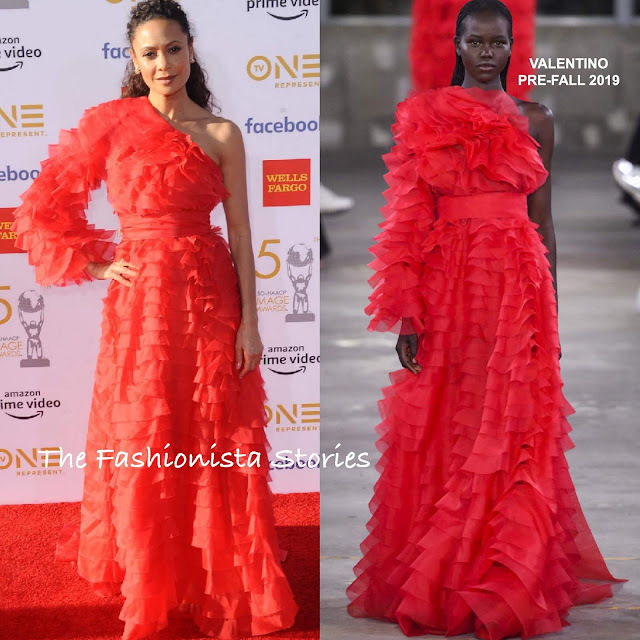 The actress could not be missed wearing a VALENTINO PRE-FALL 2019 red one long sleeve ruffle organza gown, featuring a cinched waist. To compliment her detailed gown, she wore her natural curls in a half-up, half-down off-the-shoulder hairstyle. I love the model in this gown on the runway but Thandie pulled it off as well. Accessorized with statement earrings and red sandals, she finished up her beautiful look with minimal make-up.